When people talk about non-league they’re generally referring to the leagues between the Conference (step one) and step six, such as the North West Counties division two (unless they like their football really agricultural). The number of leagues at these steps is 1-2-3-6-14-17 respectively. Within this mainstay you will see grounds with lights, stands, terracing, hard standing, snack bars etc – the general gubbins you’d expect from a proper football ground. 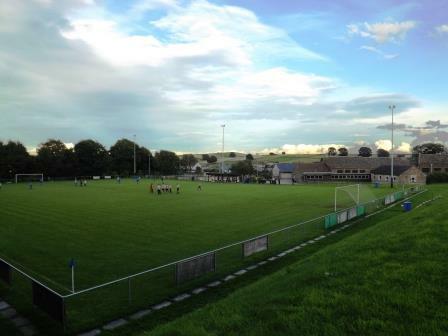 At step six, generally (depending on the league requirements) grounds require a covered stand, housing a minimum of 50 seats, covered terracing for 100, floodlights and hard standing round the whole pitch. All clubs are required to issue programmes, too. Upwards from step six the criteria increase in terms of numbers housed as well as the more arcane snippets of legislature involving the size of the referee’s toilet, washing facilities and the choice of pork scratchings on offer. Beneath this dependable core of floodlit proper grounds is the fat scary end of the pyramid, going all the way down to jumpers for goalposts and some unwitting dog-walker going in goal to make up the numbers. Step seven is mostly county specific leagues, with steps eight and nine their lower divisions. Ground grading is a lot more relaxed, as you’d expect; a railed pitch if you’re lucky, roped off if you’re not, sometimes a hybrid of the two. You might get a snack bar, you might not. 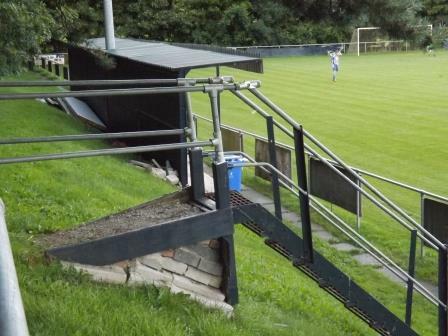 Stands are rare, as are programmes, floodlights rarer…but they exist! Sometimes you get all three. And once you start looking you’ll be surprised at how many can be unearthed, and some are exceptional. Their rarity makes them all the more delectable, like four leaf clovers. 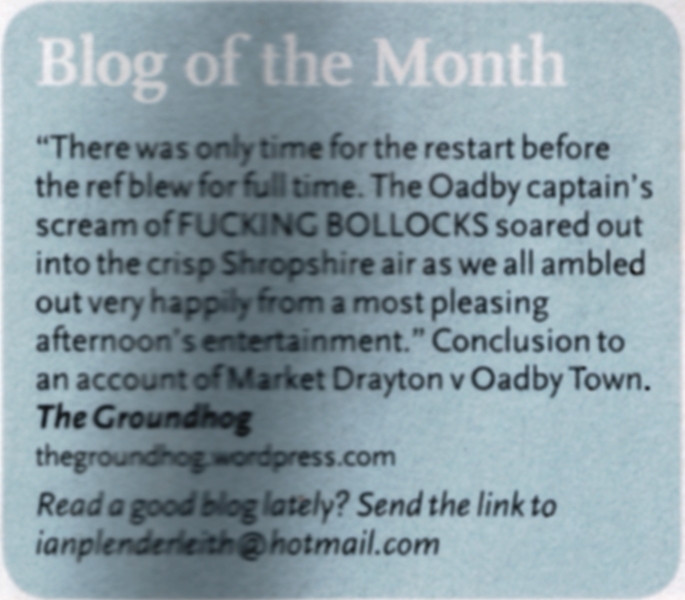 Getting a programme at this level is pure non-league gold. Finding a great ground with a proper stand and maybe even floodlights at county level is like entering a dodgy looking pub to find they sell a selection of cask ales. I think my favourite is Tideswell United. They play in the Hope Valley Amateur League, a league so obscure it isn’t even listed in the football pyramid. 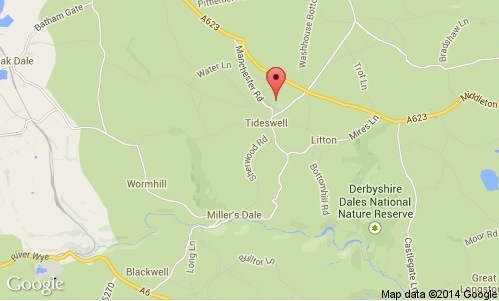 Tideswell, home to the Cathedral of the Peak, population 1,800, is a quaint, sleepy, typical Peak village. The kind of place you’d expect to find the markings of a pitch by the side of the road, where two Sunday league sides vie on a muddy field with rusty goalposts and moth eaten nets; not the dapper floodlit ground that is the Tideswell Sports Complex, just a short walk from the town centre. For the Hope Valley league the ground is ridiculously over qualified. It’s like a physics graduate working the till at the Co-op. The few others I’ve seen in the league are little more than the pitches you’d expect at this level, albeit with some great Peak views thrown in. I went to see Tideswell in a friendly last August against lower division rivals Buxton Town, who play in the second tier of the HVL – division A.
Tideswell is at the bottom end of the Peak District to the west, not far from Buxton and near the picturesque Miller’s Dale. It lies at an altitude of 1,000 feet, was once a lead mining hotbed and is the birth place of Julia Bradbury’s Dad. 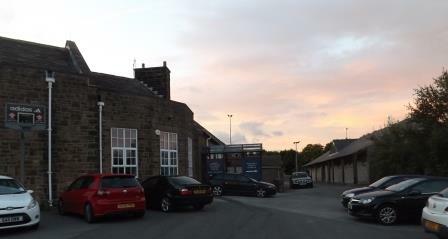 A left turn after St John the Baptist Church, the 14th century Cathedral in the Peak and a short walk up St John’s Road takes you to the Bishop Pursglove Primary School (the ground is sometimes known as just Pursglove). Access to the ground is through the school play-yard. A perimeter bar and a flagged path frame the ground, with another bar framing the steeply elevated section behind the goal and down to the stand. Two flights of stairs give access between the lower and upper decks, one behind the goal and one to the side. 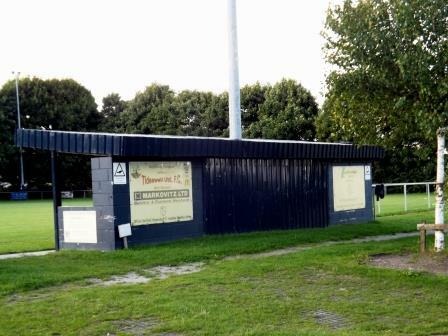 A corrugated stand providing both seats and standing cover sits on the far side with the letters TUFC emblazoned on the back. Posh dug outs sit on the opposite side of the pitch. Buxton Town belied their lower division status in this game by thoroughly trouncing their hosts 4-1. It could’ve been a lot more. Surprisingly given the hosts normal showing in the top division. The pulchritude of Pursglove is best appreciated from the top of the hill behind the goal, where you have a view of the peak in the distance and a full panorama of the ground. A must get ground for collectors of those rare gems in the minor leagues. This entry was posted in Travelog and tagged buxton town fc, hope valley league, non league football, pursglove, Tideswell, tideswell united. Bookmark the permalink. 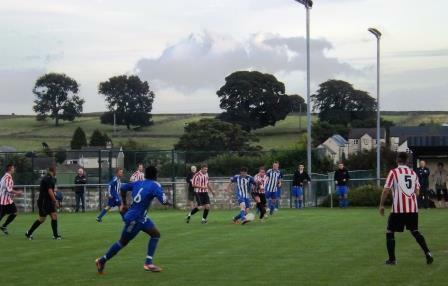 Tideswell 4 Buxton 1 was the actual result Tideswell in the red and white stripes. Fresh Peak Park air must have taken its toll. You’re not kidding! How embarrassing. I sometimes mix the teams up for the first five minutes but the whole match?! have had any call on use of the pitch. The quality of the facility is all down to Lottery money and local support.